Direct connect telephone headsets(2.5mm stereo plug) with noise canceling are ideal for most standard telehpones equipped with standard 2.5mm headset port. You can plug them directly to a 2.5mm headset jack on most basic and business phones such as Polycom Cisco Linksys SPA, Panasonic Zultys AT&T Aastra GrandStream and many many cordless DECT phones with standard 2.5mm Headset Port. Direct connect over-the-head headset, No additional amplifiers or adapters required, Most easy setup headset solution. Noise canceling microphone to reduce background noise and Acoustic Shock Protection circuit to protect your hearing. 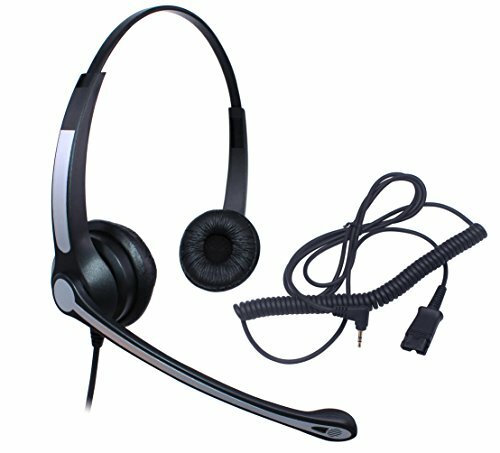 Superior Call Center quality headset, excellent sound quality, lightweight, durable and comfortable for all day use. ONLY PURCHASE IF YOU HAVE ONE OF THE PHONE MODELS LISTED BELOW, CHECK OUR STORE FOR HEADSETS FOR OTHER PHONE MODELS OR CONTACT US FOR COMPATIBILITY GUIDE! NO Mic Mute / Volume Control built in. If you have any questions about this product by Audicom, contact us by completing and submitting the form below. If you are looking for a specif part number, please include it with your message.